work examples, and suggestions for better photography. 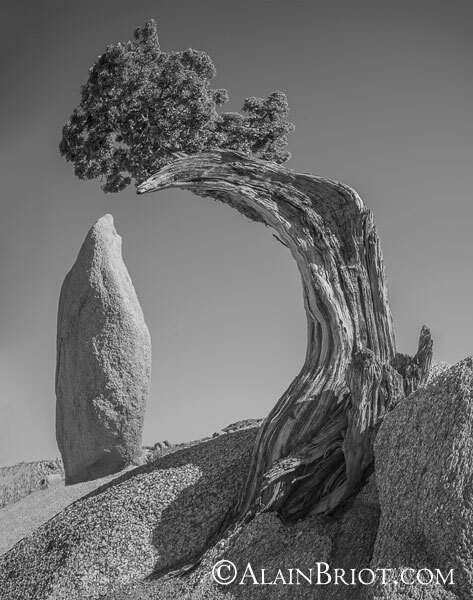 Announcing an exciting, photographic-instruction oriented California workshop with professional photographer and instructor Alain Briot and art instructor Natalie Briot! We are pleased to announce a brand new workhop, one that is quite different from those we have offered so far. 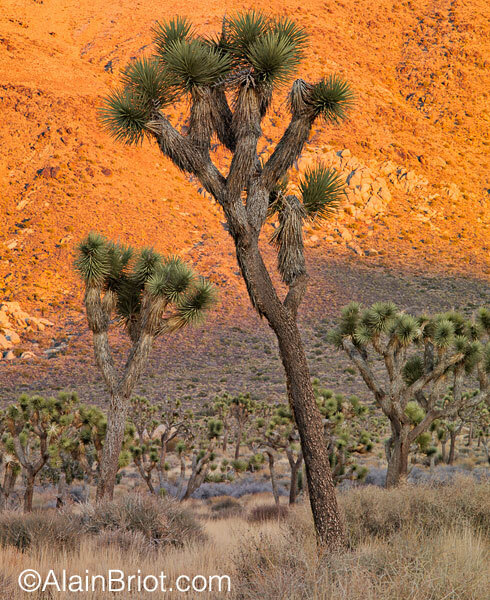 This workshop focuses on Joshua Tree National Park and surrounding areas. 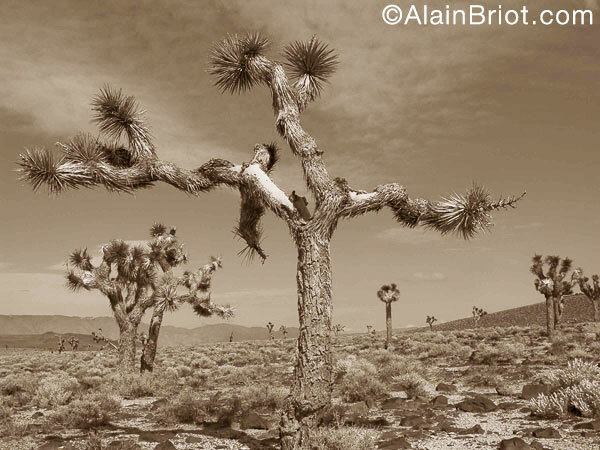 During this workshop we will explore the photographic opportunities offered by Joshua Tree National Park. 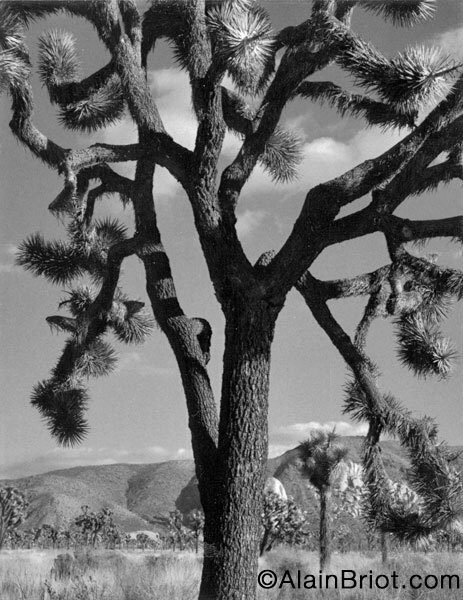 We will also explore the photographic possibilities offered by the surrounding area such as Big Morongo State Park. This workshop will take place March 8th to 12th, 2019. We will meet you in Twenty Nine Palms, California which will be our base for the entire workshop. The itinerary for the workshop was designed by Natalie and I with two goals in mind: convenient travel arrangements and exciting photographic opportunities. We will stay at the Holliday Inn Express in Twenty Nine Palms for the entire duration of the workshop. We will meet in Twenty Nine Palms, California. The exact location in Twenty Nine Palms will be emailed to you after you register. After doing orientation and giving our first presentation of the workshop, on vision and personal style, we will photograph sunset in Joshua Tree National Park. We will conduct print reviews in the afternoon. 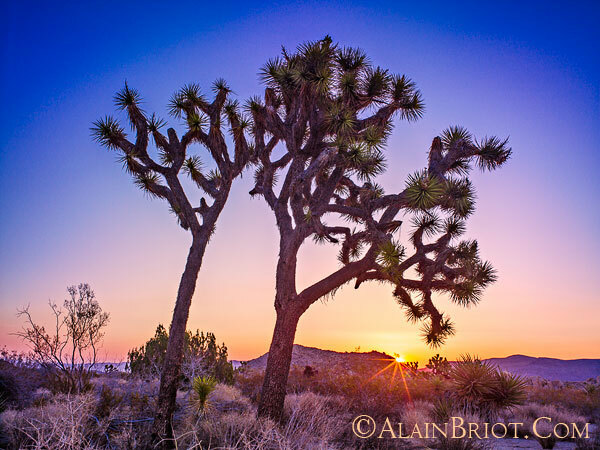 We will photograph both Sunrise and Sunset in Joshua Tree National Park. 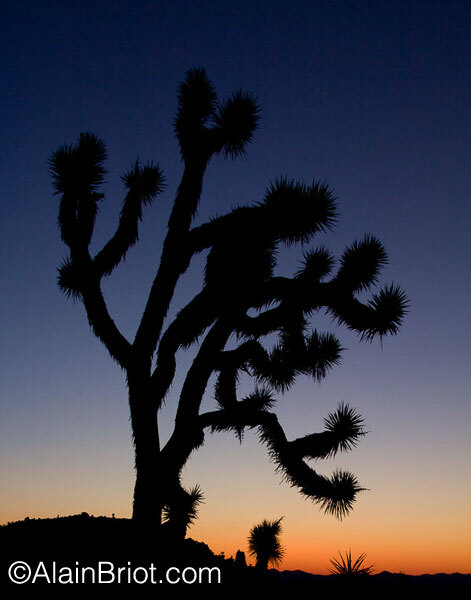 On Sunday we will start by photographing sunrise in Joshua Tree. In the afternoon we will photograph in the Big Morango Canyon State Preserve. Afterwards, we will visit a photography gallery in Palm Springs. It time allows it, we will photograph sunset on the way back in Joshua Tree. We will give presentations in the field. 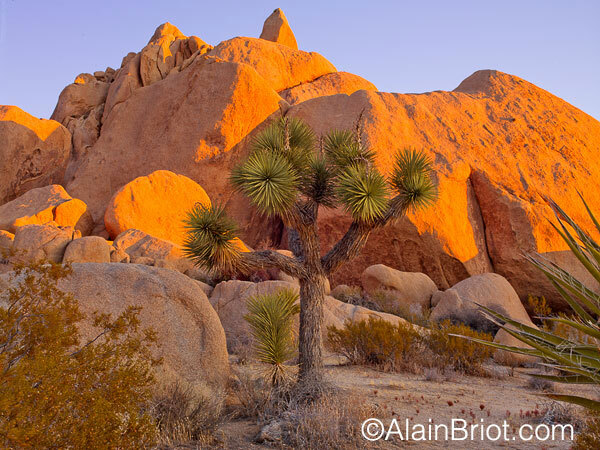 We will photograph Sunrise in Joshua Tree National Park, at a location selected the day before for its photographic opportunities. The workshop will end after Breakfast to give you plenty of time to drive back to the airport and to your home destination. The focus of this workshop is creativity and developing a unique style. These are very important areas of photography that are rarely taught in workshops. They are the areas that will make your work stand out from everyone else's work by making your work unique to you. You will be practicing photographic skills exercises designed to help you strengthen your skills in this area during the workshop. You will receive handouts with a description of each exercise and we will go over the exercises with you, explaining to you both the theory and the practical side of each exercise. You will then be asked to conduct these exercises on your own. Make sure to bring a folder where you can store your handouts, a notepad to take notes during the workshop, and several pens and pencils. Don't let this unique opportunity pass you by! Because this is a new and unique workshop, we expect seats to be in high demand. To be fair reservations will be taken on a first come first served basis. If you have been thinking about building up your portfolio, if you have been thinking about becoming more serious about your photography, if you want to photograph some of the most beautiful photographic locations while receiving photographic instruction, don't hesitate another second: sign up now. This is truly a once in a lifetime opportunity! The registration fee for this workshop is $1495. If you are an Alumni, meaning you have already attended a workshop with us, you receive $100 off the regular fee therefore your registration is only $1395. We accept Visa, Mastercard, Discover and American Express. A receipt will be emailed to you the day after your registration has been processed. You can charge the registration fee in one installment or in 3 equal installments placed to your card a month apart starting when you register. Just let us know your preference when you sign up. Registrations are allocated on a first come, first served basis. We recommend you act now because our workshops sell out quickly. This workshop is for you if you have been thinking about studying photography under the guidance of Alain and Natalie Briot, two professional instructors, if you want to build up your photographic portfolio, develop your personal style, or if you visit and photograph locations that offer exciting and unique photographic possibilities. - We will email you directions to Joshua Tree National Park as well as a list of hotels in Twenty Nine palms when you register. You will then receive an email with the Friday evening meeting place and a detailed workshop schedule approximately 2 weeks before the workshop. - We will be photographing from 2000 to 4000 feet elevation on average. Normally the only problem you can expect is a slight shortness of breath. However the higher elevation is something to keep in mind if you live at sea level or you are prone to encountering physical difficulties at higher elevations. A personal print review will be conducted during this workshop. This print review will focus on composition, print quality, image optimization, personal approach to photography, and more. Make sure to bring 6 prints of your work, 10x15" or larger print size, to share with the group. Our print reviews are friendly and helpful and will allow you to present your work, ask questions, and receive answers and feedback from both the group and Natalie and Alain Briot. This is a print review, not a print critique. Our goal is to help you improve your skill and build your confidence level regarding your photographic skills. If you participated to our workshops previously we strongly recommend you bring photographs created during your previous workshops. All monies are non-refundable. If you cancel participation in this workshop your registration fees may be transferred towards registration in another Beaux Arts Photography workshop under certain conditions. Transfer of fees to another workshop is not automatic and is decided solely by Beaux Arts Photography as a courtesy. We reserve the right to decide whether to transfer your fees to another workshop or not. You must register for another workshop scheduled one year or less from the starting date of the workshop you originally registered for. If you need more time we may be able to extend the transfer time beyond 1 year. Participants transferring from another workshop will be registered for this other workshop in excess of the regular number of participants. We can only accept two transfers per workshop. If you decide to attend a higher priced workshop, or if the workshop fee has increased, the difference in cost between the two workshops will be charged to your credit card when you notify us that you want to sign up for this other workshop. A ten percent transfer fee will be applied at the time of transfer. In order to get a transfer credit you can only cancel one workshop, Summit or seminar per calendar year. Your registration is guaranteed only when we have payment in full. We reserve the right to change this policy at any time. Workshop fees can only be transferred to another workshop and cannot be used towards purchase of a product such as mats, portfolio cases, CD or DVD tutorials, prints, portfolios, or other. Workshop fees cannot be transferred towards purchase of the Mastery Workshop DVDs. We cannot transfer consulting fees towards workshop registration. If this workshop is cancelled by us you will receive a full refund. By registering for this workshop you agree to this policy. By joining this workshop I acknowledge that I have read the above information concerning responsibility and release Beaux Arts Photography, Alain Briot, Natalie Briot, their guides, instructors and any cooperating agent from any liability. Beaux Arts Photography, Alain Briot, and Natalie Briot will assume no liability for injury, illness, or loss of personal property or expenses thereof associated with workshop participation. I also acknowledge that Alain and Natalie Briot have the right to refuse service to anyone at anytime and that workshop policies are subject to change at any time.